WEST LAFAYETTE, Ind. — A new type of membrane that separates oil from water developed by Purdue University material engineers may be used to clean up oil spills such as BP’s massive spill in the Gulf of Mexico. A new membrane, licensed through the Purdue Research Foundation, that separates oil from water could help clean up spills. 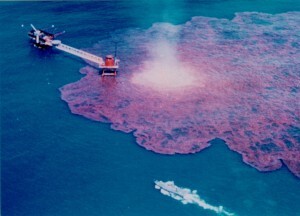 The photo above is the ITOX 1 exploratory well in the Bay of Camphece in the Gulf of Mexico that blew out on June 3, 1979. By the time the leak was contained in 1980, apprx. 140M gallons of oil had spilled into the Gulf of Mexico. The IXTOC I is currently number 2 on the list of largest oil spills of all-time. Jeffrey Youngblood, a Purdue assistant professor of materials engineering, has created technology that could eventually be used to help with environmental cleanups. The technology could be used for a variety of other applications, including water purification and industrial uses. The new technology, which is being licensed through the Purdue Research Foundation’s Office of Technology Commercialization, would last longer than conventional filters for separating oil from water and works by attracting water while beading oil, traits that are usually mutually exclusive. Researchers have tested the materials with solutions containing oil suspended in water, similar to concentrations existing in oil spills and other environmental cleanup circumstances. “Oil dispersed in water and then run through these filters is resulting in a 98 percent separation,” Youngblood said. Such filters also might be used in other situations, such as removing oil from a ship’s bilge water or cleaning wastewater contaminated with oil.